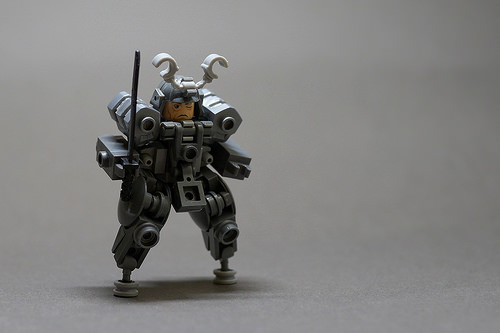 SenSeiSei brings us a fabulous little Samurai-flavored exosuit. There’s an impressive sense of heft here, despite the model’s small scale, and some interesting parts usage — particularly good work on the “big fig fists” as shoulder armor. The level of greebling creates a depth of detail and texture, and I really like the unusual “tip toe” design of the legs and feet. Now I want to see seven of these magnificent mecha, defending a village from marauding rogue AIs.